Unfortunately, I had to pass up about five invitations to Asia Hall from Publisher John Ortega during the past month, but we finally managed a hastily arranged visit on a Monday evening. John had already informed me that Asia Hall had risen to the top of his favourites list. Asia Hall is located on the third floor of the Vremena Goda mall, which is at Kutuzovsky 48, on the right side as you head out of town. Vremena Goda (seasons), which caters to the elitny crowd that traffics by, is pretty quiet, so it’s not difficult to get in and out of the parking garage. Apart from the fact that the brands are among the most expensive, there is nothing particularly distinguishing about the mall, and thus the entrance to Asia Hall. The wait staff seated us at John’s favourite table by the open kitchen prep area, large and round with a “lazy Susan” and about a half a dozen shiny Peking Ducks hanging nearby. Jack Wong, the Singaporean executive chef, was away but Chef Anatoly Kharchenko came over to greet us. Chef Kharchenko apparently became a chef in 1997 after leaving the Russian tax service and traveling to Montreal. After several years in Montreal’s kitchens he returned to Moscow for stints with Marriott and several casinos. John already knew his favourites, but I took a thorough look over the menu and wine list. 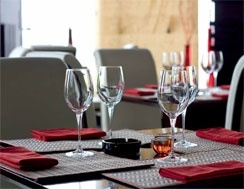 The pan-Asian menu has an extensive selection of dishes that includes samplings from many cultures: sushi and sashimi, Peking Duck, dim sum, among many others. 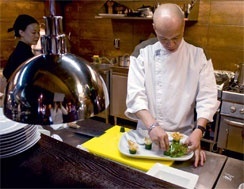 John first ordered the Wasabi Prawns (600r), a variant of a dish that has become a standard at Moscow’s “Asian Fusion” restaurants. This presentation was delicious, very fresh, meaty prawns dressed with a green, slightly sweet wasabi sauce and orange flying fish roe, and served with “Wasabi peas” and mandarin slices. The (substantial) Vietnamese Spring Rolls (380r) followed. These were huge rice wrappers rolled around fresh carrot, green mango, cilantro and a bit of iceberg lettuce, garnished with a thin, bright red, spicy dipping sauce. Unlike Chinese spring rolls, Vietnamese are not fried and are presented open-ended. We also tried Chinese Fried Rice (300 roubles), a large patty of relatively bland, somewhat oily rice with chicken and pork. Out came an order of one of John’s favourites, Chili Crab (1750r) – a Singaporean tradition that consists of lengths of deep fried, lightly breaded Kamchatka crab swimming in a platter of red chili sauce. The sauce was not particularly spicy and it was served with several bright white and soft and slightly sweet rice buns that are meant to slop it up – these were delightful and I was thankful that the basket was placed near my end of the table. The last entrée was Stir Fried Lamb with Black Pepper and Mint (1100r), and I was very surprised at how tender were the small pieces of lamb. I was extremely pleased with the food at Asia Hall, and the pricing seems relatively fair in Moscow terms. However, I must dish out some scorn for the wine selection and pricing system. The wine list, though not extensive, has a few interesting wines, for instance the South African Glen Carlou Chardonnay 2007 (4000r) that we ordered – a previous vintage of this wine took a place in the Wine Spectator Top 100 list a few years ago. But how could this wine be practically the least expensive white wine on the list; the least expensive white is 2,500 roubles and the cheapest red is 4,000 roubles. The price mark-up at Asia Hall appears to be four times retail – retail!! And that’s not the main problem – can’t they find wines that, even with such an outrageous mark-up, would end up at 1,500-2,000 roubles? The wine price situation has taken a turn for the worse at some Moscow restaurants in the past year or two, with lower priced wines stricken from lists. Perhaps it’s the attitude I heard was expressed by one well-known Moscow restaurateur when he entered one of his restaurants, “I don’t want these people in my restaurant – let’s raise the prices.” I don’t know the reason(s) prices are so high, but it’s surely not the standard answer, which we heard from Anatoly, “well import costs are so high.” This is just not true – the importer costs for Glen Carlou should be about $15 delivered and customs cleared in Moscow. John paid $140. I would like to go back to Asia Hall – the food was wonderful, just as John had promised – and I could have a nice dinner for two with, let’s say, the Vietnamese Spring Rolls, Wasabi Prawns, Chinese Fried Rice, and the Stir Fried Lamb for 2380 rubles ($82), not bad. But a bottle of wine would double or triple the bill.